consult "Related Products" tab to see what medallion will fit this holder. 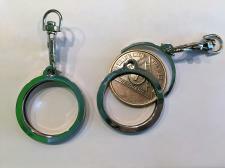 Cool round stainless steel medallion holder, which is perfect for displaying your various years of sobriety. This holder securely holds gold plate, silver/gold bi plate, as well as bronze medallions in a very fashionable way with a clear view of the front and back of the medallion for awesome visibility (NOT a good fit for enamel medallions). It loads from the top and very secure against losing your medallion. The clip attaches to keys, the belt hoop of your jeans, or to a purse. Perfect gift for you or someone you know.